乳腺活组织检查显示为癌。值得注意的是不规则的边缘与多样的切面。此小癌块是经乳腺X射线照相发现的。肿块边缘被墨水染成绿色，目的是在组织学切片做成后辅助判断癌浸润到边缘与否。 This breast biopsy demonstrates a carcinoma. Note the irregular margins and varied cut surface. 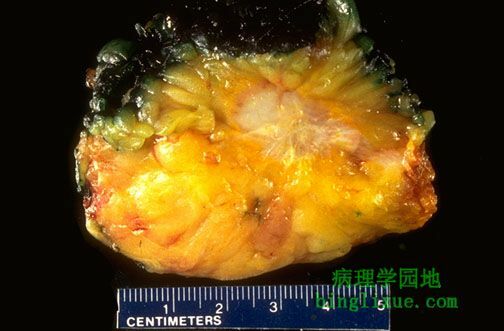 This small cancer was found by mammography. The margins of the specimen have been inked with green dye following removal to assist in determining whether cancer extends to the margins once histologic sections are made.